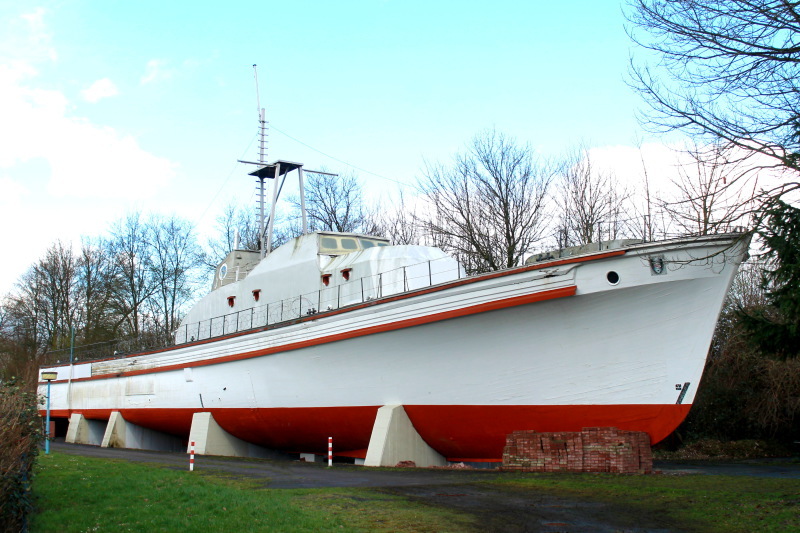 This former minesweeper of the German Navy (Schütze - Class Type 55) is seen here preserved at Datteln/Germany. She was handed over to the local Marinekameradschaft (former German Navy servicemen) at Datteln in 1976 and is used since then for different events and meetings. The vessel served as KREBS M1093 with 5. MSG at Olpenitz/Germany from 07/1959 until 01/1960. From 01/1960 until 01/1961 she was withdrawn from use due to problems with the propulsion system. She subsequently served with 1. MSG at Flensburg/Germany from 01/1961 until 10/1973 as KREBS M1052. After being laid up at Kiel for the next three years she was handed over to the Marinekameradschaft Datteln in June 1976. Moin Volker, unfortunately I can't answer your question concerning these engines but I think they might have been fitted to other vessels ? I'm glad you like the pic, many thanks for your comment my friend. Best wishes to you and Hannelore and enjoy the weekend as well. Moin Hans my friend.Nice shot and a good description.Are the Mercedes engines still onboard?! We wish you and Renate a wonderful weekend. Cheers,Volker. This photo has been shown 419 times since it was added to the site.